I am a Russian-American at heart (both my parents immigrated to the States just a year before I was born) so you’d think that, when I decided to live in Russia for a year, I’d be somewhat used to the food. I could not be more wrong. About two weeks after moving here, I began to despair of ever eating another nutritious meal. Almost every meal consisted of some form of meat and potatoes, with none of the healthy grains, vegetables, or fruits I was used to seeing, and I was forced to turn to McDonalds salads for my necessary intake of greens (definitely a low point in my life). But eventually, Russian cuisine started to make sense to me – I not only found cultural reasons for the carb-heavy diet, but I also started trying out more traditional Russian dishes and realized that maybe there was more to Russian food that I originally thought. Let’s start at the very beginning. When I first started questioning the Russian need for meat and potatoes, my grandfather explained their diet in historical terms. Imagine, for a minute, that you lived back in ancient Russia, a freezing, barren wasteland, and had to figure out some way to live through the winter. Forget preserving anything fresh, because that’ll spoil right away. Instead, the Russian people back then stored meat, in the form of actual living animals or salted meats which were stored throughout the cold, and root vegetables, such as beets, carrots, and onions. They also needed food that was starch-heavy and was rich in calories, but inexpensive to grow or raise. 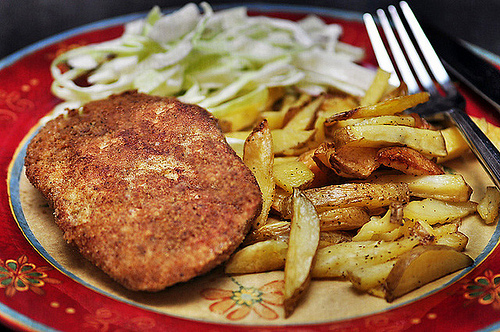 Hence, the Russian culinary love for potatoes was born. Russians also eat a lot of bread and use fatty condiments, such as mayonnaise and sour cream. As I soon learned, this trait is tied to the poverty in which many Russian citizens lived as well. Throughout history, Russians needed to eat foods that would get them through the freezing winters and difficult times – historically, Russia’s had quite a few of those, the most recent example being the Soviet Era. So what better way to pack on the pounds than adding bread and extra calories to everything? Of course, this is no longer necessary, but a lot of Russian food is based on these primary ingredients – and they actually taste amazing. One such example is a pancake dish that Russians love. These pancakes, or “bliny”, are essentially a Russian version of crepes, which can be eaten with everything from caviar to Nutella or jam. 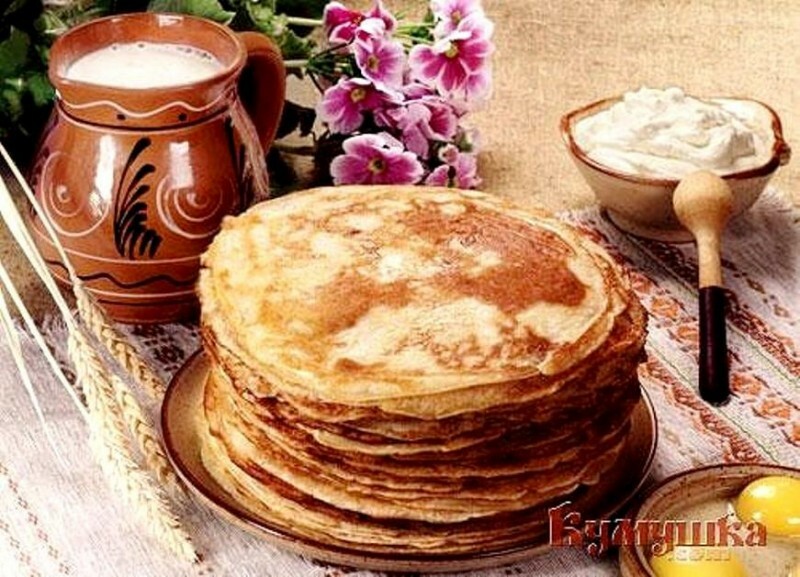 There’s even a special week right before Lent, called Maslenitsa, where the primary food is pancakes. It’s a genius idea, and a delicious meal at any time on top of that. Russians also eat a lot of soup – understandable because their country is freezing. My personal favorite is a soup called “borscht”, a distinctly red soup made of beets, along with other root vegetables, potatoes, and meat. The taste is really unique, because of the beet-infused broth, and topped with sour cream, this dish cannot be beat. Russians have their fair share of delicious entrees too. I was completely opposed to eating sour cream in any dishes when I first got here – the taste was bland and it wasn’t even healthy. But a lot of really great dishes here are made with sour cream – in fact, one chicken dish with a sour cream and carrot sauce has become my favorite. And while the ingredients Russian use in the kitchen may not be too varied, the resulting meals come in all shapes and sizes, making for an exquisite culinary experience. Russian food can be a little hard to understand at first – I would be the first to admit it – but once you understand some of the history behind Russian cuisine and try more of their meals, it’s hard not to fall in love with Russian food. Lizz Dorovitsine is a high-school graduate who took a gap year to live and work in Russia. She currently works as an English editor for the World Economic Journal, and writes for her personal blog, “How to Survive Russia” (www.howtosurviverussia.com) in her free time. To read more about Lizz’s story, click here: http://howtosurviverussia.com/my-story/ . Have you heard about great Uruguay’s ASADO recipe? Hey Agnes. I spent a year in Russia and was really worried about what I would eat there. I was proved dead wrong. I’ll have to agree with you – they’ve got some great dishes!